Legal assistant Barb Somers, who was one of the hundreds of keen runners who took to the streets of Shrewsbury recently for the town’s first 10k race, is now aiming for European qualification as an amateur athlete. 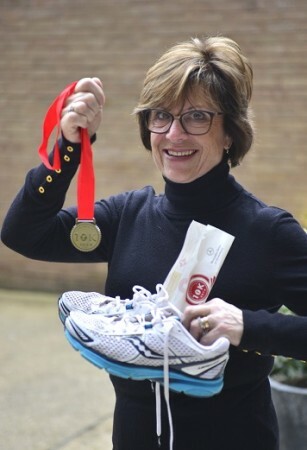 Barb, who is a top national triathlete in her age group, finished the winding course around the town in her target time and was sponsored by her employers Wace Morgan Solicitors for £100, which was donated to the charity Crohn’s and Colitis UK. She commented: “The event was very well organised, I thoroughly enjoyed it despite finding Port Hill hard running! Barb, who is 63 and lives in Cressage, regularly competes in triathlons, with her next one being the Nottingham Sprint on May 28 which is a pre-event for the European championships 2017 which she is hoping to qualify for. She has a successful record in national and international events and has previously taken part in the GB Age Group Team, finishing 15th in the world championships. “I am now also a British Triathlon Federation official/referee which takes me all over the county officiating in events,” added Barb, who works in the commercial conveyancing department at Wace Morgan’s Shrewsbury head office.